Friday afternoons at work have to be the slowest!!! The clock just doesn't want to move!!! I was touched by this article, in particular the picture of the World's Second Youngest Preemie. After lunch, I thought I was going to run upstairs and get a nutrigrain bar or a fruit to satisfy my sweet tooth. I ended up putting it off until it was time for my snack, so I guess I didn't need it to begin with! 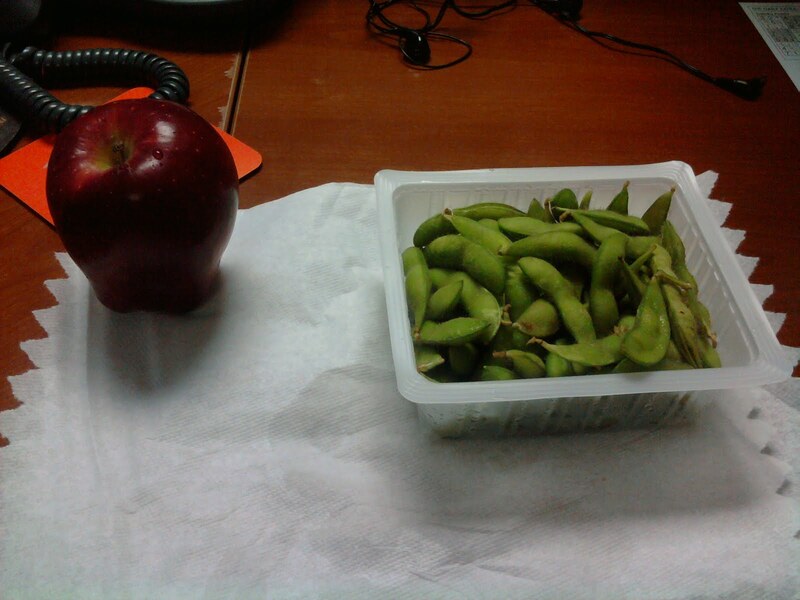 Instead, I had some more yummy edamame a long with a sweet apple. That should hold me over until dinner! Richard & I have been noticing that we've been going out to eat more often than we used to. I think it has to do with the 9/80 schedule because we'll have 2 or 3 breakfasts on the weekends, plus we'll go out Friday's and Saturdays. If I feel like I've done too much on Sundays, I won't hesitate to order out either! In an effort to curve those habits, we're starting a new tradition. The question is, should I stop somewhere and buy the frozen variety and pair it with some veggies. Or go with delivery?? ?